Accumetrics is at the forefront of revolutionizing the way doctors manage the tens of millions of patients who take antiplatelet drugs to prevent heart attack, stroke and other potentially life-threatening cardiovascular events. Accumetrics is a privately-held company based in San Diego, California. The company develops, manufactures, and markets the VerifyNow® System, a comprehensive suite of tests for the assessment of platelet response to antiplatelet therapies. The tests are fully automated and easy-to-use allowing physicians an accurate way to assess platelet response to optimize the effectiveness of antiplatelet therapies, and to guide treatment decisions in patients who may be at risk of a life threatening thrombosis event or bleeding complication. 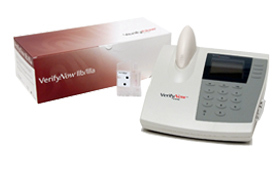 The VerifyNow System provides you with an easy, rapid and proven solution to assess your patient’s response to antiplatelet medications such as aspirin, clopidogrel, prasugel and GP IIb/IIIa inhibitors. Aspirin binds to the COX-1 enzyme to prevent the conversion of arachidonic acid to thromboxane A22, which result in platelet activation. The VerifyNow® Aspirin Assay utilizes arachidonic acid as the agonist to measure platelet function specifically along this pathway. 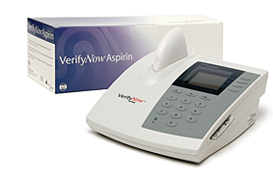 Research shows that patients' response to aspirin varies1,2, and up to a quarter of patients are not responding adequately to its antiplatelet effects.3 These patients are 2-3 times more likely to have a major heart attack or stroke.3 The VerifyNow Aspirin Assay provides a simple measurement to determine whether or not a patient is responding to their aspirin therapy. Lev EI et al. Aspirin and Clopidogrel Drug Response in Patients Undergoing Percutaneous Coronary Intervention. J Am Coll Cardiol 2006;47(1):27-33. Lee PY et al. Low-dose aspirin increases aspirin resistance in patients with coronary artery disease. Am J Med 2005;118(7):723-7. Gum PA et al. A prospective, blinded determination of the natural history of aspirin resistance among stable patients with cardiovascular disease. J Am Coll Cardiol 2003;41(6):961-5. Thienopyridines such as Plavix® (clopidogrel) and Effient® (prasugrel) block the P2Y12 ADP binding site on the platelet. The VerifyNow P2Y12 Test uses an ADP agonist to induce platelet activation and ascertain the level of platelet reactivity impaired by these medications. It also incorporates a second channel containing thrombin receptor agonists to approximate baseline reactivity so that there is no need to discontinue antiplatelet medication. Studies show that up to 30% of patients taking Plavix have low levels of platelet inhibition (reactivity)1,2 and do not receive the expected antiplatelet effect which may increase the risk of ischemic events or unnecessarily delayed from surgery. The quantitative test is a simple measurement to help assess the patient’s level of response to their therapy. Malinin, A. et al. Monitoring Platelet Inhibition after Clopidogrel with the VerifyNow P2Y12 Analyzer: The Verify Thrombosis Risk Assessment (Veritas Study). Thromb Res 2007;119(3):277-284. Serebruany, VL. et al. Variability in Platelet Responsiveness to Clopidogrel among 544 Individuals. J Am Coll Cardiol 2005;45:246-51. Glycoprotein (GP) IIb/IIIa inhibitors such as ReoPro® and Integrilin® are fast acting and powerful inhibitors of platelet aggregation that prevent the binding of platelets to fibrinogen. The VerifyNow® IIb/IIIa assay utilizes a thrombin receptor activating peptide as an agonist to maximally stimulate the platelet and determine the level of platelet function. Research shows that patients’ response to weight-based dosing varies, and the assay provides clinicians with an accurate assessment of platelet blockade within two minutes from the time of sample collection.